The regular news is just to irritating with Obama working hard to cut Social Security benefits, surprise, surprise, among other things. So I thought I’d focus on just the science section of the TC paper today. Oh, and I’m horribly late due to getting back late from an away game (i.e., meetings, yuk), and sleeping in. So let’s see what’s happing with people actually trying to do something good in the world unlike our politicians. Red dwarfs are stars like the sun, but smaller, fainter and cooler, with somewhere between one-half and one-tenth the sun’s mass. They may be small, but they are legion—astronomers estimate that red dwarfs outnumber sun-like stars in the Milky Way by a factor of 100. Until today’s result, astronomers had been forced to assume that the 100-to-1 ratio held in other galaxies, too. But evidence has been mounting recently that elliptical galaxies—which lack the distinctive spiral arms of galaxies like the Milky Way and are usually made of older, redder stars—had more stars relative to their dark matter than spiral galaxies do. “Within these galaxies, a good chunk of the mass that had been ascribed to dark matter is probably stars,” said Pieter van Dokkum, the lead researcher on the project. And of course you know what that means. More stars, more planets, more planets, more places where life exists. More things that say “eep, eep.” Wave at your new neighbors tonight. NASA’s Cassini spacecraft has taken a breath of oxygen while passing over the icy surface of Saturn’s second-largest moon, marking the first time a spacecraft has directly sampled oxygen in the atmosphere of another body. Cruising just 60 miles above Rhea, one of more than 60 moons orbiting Saturn, Cassini found an extremely thin atmosphere of oxygen and carbon dioxide likely sustained by high-energy particles slamming into the moon’s frozen surface. Rhea’s isn’t the only other atmosphere in the universe, but it is so thin that Cassini had to fly through it just to confirm that it was there at all (other atmosphere’s have been detected and studied from afar by tools like the Hubble Space Telescope). According to Cassini’s onboard science instruments, Rhea’s atmosphere contains something like 50 billion oxygen molecules per cubic meter, matched by 20 billion carbon dioxide molecules. The mission, Lockheed says, will serve several purposes. Most immediately, it would allow astronauts to study, via unmanned robots, some lunar real estate that hasn’t been seen with human eyes since the Apollo missions. But its real function is to test out technologies and skills that will be necessary to make a manned trip to an asteroid, and then on to Mars. 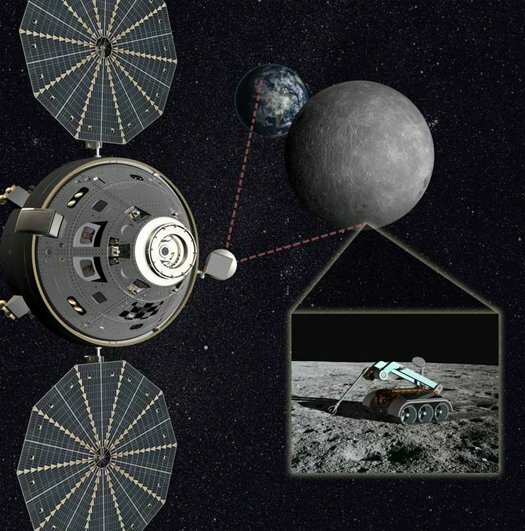 The idea is to park an Orion space capsule at the L2 Lagrange point about 40,000 miles above the moon’s far side, where the combined gravity from the Earth and the moon would allow the spacecraft to essentially hover in one place in sync with the moon. From there, the astronauts would deploy and conduct remotely-operated surface science, collecting rock samples and exploring the South Pole-Aitken basin, one of the oldest craters in the solar system. From the L2 point, the capsule would continuously maintain line of sight with both the Earth and the far side of the moon. I think unmanned missions is the way to go for a lot of these explorations. Much more cost effective and quicker to execute. We can revolutionize our materials science, our manufacturing, and our economy with such efforts. Or if we don’t, China can. Harvard scientists may be a step closer to a medical fountain of youth after figuring out how to reverse the aging process in mice. The breakthrough could lead to a way to slow the aging process in humans which in turn could extend quality of life by reducing the impact of age-related ailments like heart disease or dementia. That is, if it doesn’t kill them first. Harvard Medical School scientists turned unhealthy old mice into youthful versions of themselves by tampering with an enzyme called telomerase. While the aging process is not totally understood, one of the many factors that causes the deterioration of the body’s tissues is tied to telomeres, which protect the end of each of the chromosomes in DNA. When cells divide, the telomeres are cut shorter and shorter until eventually they stop working altogether and the cell either dies or goes into a dormant state. The researchers genetically engineered mice that lacked telomerase, an enzyme that stops telomeres from shortening. As such, the telomeres rapidly grew shorter and the mice aged quickly, developing all the signs of old age including damaged organs, a shrinking brain, and infertility. The researchers then injected the mice with a cocktail that reactivated their telomerase. This didn’t just slow the aging process, but actually reversed the effects of aging, essentially making the mice grow younger. But rejuvenating old organs in mice does not necessarily mean a human treatment is on the way, the researchers warn. For one, mice make telomerase throughout their lives, but the enzyme is switched off in adult humans, as it can cause unchecked cell replication (read: cancer). None of the mice in the study developed cancer, but there’s no telling if human tissues would tolerate the treatment so well. A lot of anti-aging research seems to come down to age vs. cancer. That is, if you can change cells so they don’t age, then the chances of cancer increases tremendously. And in fact there seems to be a direct relationship. It may turn out that in order to make more progress in dealing with aging issues, we need to get better at understanding and dealing with cancer. A win win in my opinion. More efforts to figuring out and stoping or reversing cancer sounds good to me. Silicon chips will be communicating with pulses of light instead of electrical charge starting in 2011, according to International Business Machines Corp., which described its CMOS Integrated Silicon Nanophotonics (CISN) technology Wednesday (Dec. 1) at a tradeshow. At Semicon Japan in Chiba, Japan, IBM (Armonk, N.Y.) heralded silicon nanophotonics as the enabler for future exascale processors that can execute a million trillion operations per second (1,000-times faster than today’s petascale supercomputers). “The CMOS silicon nanophotonics technology we have developed at IBM can meet the requirements for exascale systems, by scaling up per-chip transceiver bandwidth and integration density,” said Will Green, an IBM researcher involved with the CISN project. Green worked on CISN with Yurii Vlasov, manager of silicon integrated nanophotonics at its T.J Watson Research Center in Yorktown Heights, N.Y., and fellow researchers Solomon Assefa, Alexander Rylakov, Clint Schow and Folkert Horst. I for one welcome our new nanophotonic based overlords. Researchers at the Autonomous University of Barcelona have come up with an ingenious solution for keeping track of embryos and egg cells during in vitro fertilisation procedures: microscopic bar codes. These mouse eggs were tagged by injecting microscopic silicon bar codes into their perivitelline space, the gap between the cell membrane and an outer membrane called the zona pellucida, which binds sperm cells during fertilisation. The bar codes, which carry unique binary identification numbers, are biologically inert: they do not affect the rate of embryo development and are shed before the embryos implant into the wall of the uterus. The technique aims to simplify individual embryo identification, streamlining in vitro fertilisation and embryo transfer procedures. OK, sounds like it’s for a good reason. But still, a bit creepy. Studies on the impact of wireless radiation on humans are endlessly inconclusive, but a recent study on the effects of Wi-Fi radiation on trees–yes, trees–indicates that our woody friends may be much more vulnerable than we are. And trees can’t even enjoy the benefits of Wi-Fi. It’s all very unjust. The study, conducted by Wageningen University, investigated findings that trees in areas with high Wi-Fi activity (urban areas, especially) were suffering from symptoms that couldn’t be tied to typical bacterial or viral causes. The symptoms included bleeding (! ), fissures in the bark, the death of parts of leaves, and abnormal growth. Oops. Of course it’s not an issue if forests and in rural areas. But still, it’s something to look into. Perhaps they’re only hurt by certain frequency ranges that we can avoid. Last year, a study published in Environmental Science & Technology incorporated desalination into microbial fuel cells, a new technology that can treat wastewater and produce electricity simultaneously. However, putting it into practical use proved to be challenging due to current fluctuation. Zhiyong (Jason) Ren and his team with the University of Colorado Denver discovered, after six months from the initial hypothesis to completion, that they could produce hydrogen gas, which is collectible and storable, thus making improvements in the technology. That would solve our two biggest resource problems, water and energy. Nice bit of work there people. More of that please. There’s a bit of science news for you. 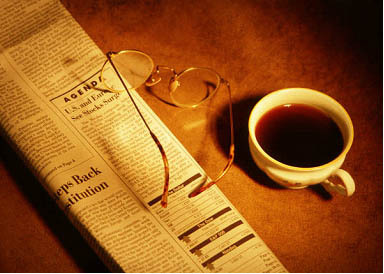 Chime in with more of that or with other news. This is an open thread.